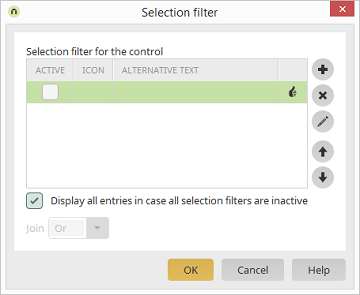 In the browser, a button will be displayed for each filter that you configure here. In this column, you can decide whether the button is already activated (active) or deactivated (inactive) when the element is loaded. Displays the path to the selected image. Displays the defined text alternative. Opens a dialog where a selection filter can be created. Removes the currently selected selection filter from the list. Opens a dialog where the selected selection filter can be edited. Adjust the order of the buttons. If this setting is not active, no entries will be displayed when all of the selection filters are inactive. The individual filters can be connected using an "Or" or an "And" link. For Or links, at least one criterion must apply so that the corresponding data is shown. For And links, all of the criteria must apply.